It was 11 June when a number of political party representatives and independent parliament members announced their withdrawal from Egypt's Constituent Assembly tasked with drafting a new constitution – some of them for the second time. The 'Egyptian Bloc' parties – including the Free Egyptians, the Egyptian Social Democratic Party and the leftist Tagammu Party – initiated the movement, to be followed by the Karama Party, the Socialist Popular Alliance and the Democratic Front Party. Those who withdrew from the assembly stated they would be giving up their seats to allow greater representation for women, young people and Coptic-Christians, while registering their objection to "Islamist monopolisation" of the assembly. The move left the assembly with little non-Islamist representation, but the controversy over the national charter did not end there. With the constitution's first draft now in the process of being finalised, political parties, groups and civil society organisations are all gearing up for the final constitutional battle, to be fought in an upcoming nationwide referendum. In advance of the showdown, a number of political parties are organising for a campaign of action, Emad Attia of the Popular Socialist Alliance Party told Ahram Online. But this time, they seek to pressure the Constituent Assembly from the outside, mainly through media and "popular awareness." "We have no intention whatsoever of rejecting the constitution on the basis that the formation of the Constituent Assembly is not representative of all factions of Egyptian society," he said. "As history shows, the famous Egyptian constitution of 1923 was written by a committee known as the 'committee of the misbehaving,' yet they were responsible for one of the best documents of our history." Nevertheless, explained Attia, "The initial draft articles are a huge disappointment. First, there's a step back on freedoms vs. the previous 1971 constitution; and second, there's a lot missing from the social and economic rights where we had hoped for steps forward." "Our last resort may be to try and push for higher conditions for passing the constitution," Attia explained. He suggested modifying the terms of the referendum so that more than two-thirds of Egyptian voters must vote 'yes' to approve the constitution, or conducting the referendum on a section-by-section basis rather than all at once. "A constitution approved by only 50 per cent+1 of the Egyptian people bears very weak legitimacy," he said. Zyad Bahaaeddin, deputy head of the Egyptian Social Democratic Party, agreed with Attia, saying that the challenge of the current, second Constituent Assembly is that there's no single, agreed-upon position regarding how to react to the assembly's unrepresentative composition. While some parties left the assembly to give their seats to representatives of other social segments, others moved in a legal direction, choosing to challenge the assembly in court. Others still, such as the liberal Wafd Party, opted to continue working within the framework of the constitution-drafting body. "We have to admit that we lost the battle for the Constituent Assembly and begin influencing public opinion about the draft charter," was Bahaaeddin’s recommendation for the path forward. For prominent political figure and founder of the Free Egypt Party Amr Hamzawy, however, the battle over representation is not lost. "We must continue to push for better representation within the Constituent Assembly," he said. "We are not trying to fish in dirty water, but rather continue to hold our position, which is that, in principle, the Constituent Assembly should reflect the entire spectrum of Egyptian society." However, Hamzawy was clear that political groups should also react to the draft articles, since there is a large possibility that assembly membership will not be altered. Similar to Hamzawy, former culture minister and acting secretary-general of the Constitution Party Emad Abu-Ghazi explained that his party's plan was to push for better representation in the Constituent Assembly and, in parallel, to look into adopting a common stance with other political parties to request the modification of certain articles. Alfred Raouf, a young member of the Constitution Party and head of its strategic planning committee, also confirmed that the party should aim for the reformation of the Constituent Assembly. "Research that I have conducted shows the proposed constitution is and will not properly be discussed, and any constitution proposed is likely to be accepted in the referendum," stated Raouf, going on to hint that, in the event that political groups find the final draft constitution unsatisfying, they would nevertheless probably lose the referendum battle. Sharing a similar view, Ahmed Tammam of the government's Information and Decision Support Centre (IDSC) also complained: "The draft constitution should be put forward for public debate months earlier so that people can understand what they will be voting for in the referendum, but this is unlikely to happen." Moreover, Alfred added: "The hearing sessions held by the Constituent Assembly are only mock sessions; none of the recommendations proposed are actually taken into consideration by the assembly." 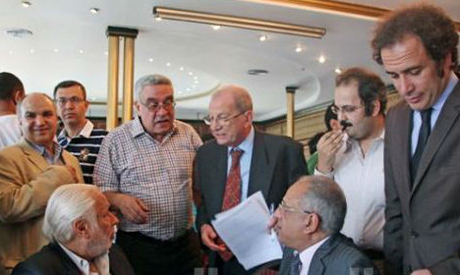 Led by Mohamed El-Beltagy of the Muslim Brotherhood's Freedom and Justice Party (FJP), the constituent assembly's Social Dialogue Committee has been holding public hearings to receive feedback concerning their proposed constitutional articles, which are also published on their website. Head of the Egyptian Social Democratic Party's women's committee Hania Sholkamy similarly complained that several women's organisations had earlier proposed names for assembly membership but that none had been considered. "The Freedom and Justice Party [the Muslim Brotherhood's political wing] merely included several women's names in the list of assembly nominees and asked MPs to vote on them," said Sholkamy. Sholkamy further complained that the current assembly did not have an accountability mechanism by which one could assess whether recommendations were actually being taken into consideration. "The hearing sessions seem to act more like a propaganda tool…So I completely refused the invitation to attend them," she said. El-Beltagy, for his part, refutes critics' claims, telling Ahram Online that all hearing sessions are in fact recorded and published on the assembly website. He added that the assembly could not possibly hear thousands of people at once, and thus the hearing sessions are by invitation only and that does not make them less representative. "We organise with the governorate to invite representatives from the various society groups, churches, NGOs, syndicates, universities etc. They know the people and so invite the appropriate representatives," stated Beltagi. This method of choosing the representatives was, however, criticised by some of those who attended the hearing sessions, including Tammam, who viewed that as an attempt to fill the meetings with government employees instead of actual representatives, a method also used by the former ousted regime. El-Beltagi further confirmed that the assembly was planning to continue holding its hearing sessions until the final draft of the constitution was finalised, encouraging people to cooperate. While most revolutionary youth groups refused to cooperate with the Constituent Assembly, April 6 Youth Movement members were amongst the few who agreed for the need to take part. Ahmed Maher, the movement's founder, is currently represented in the constitution-drafting body. On the other hand, among those parties who withdrew, some also still argue that dialogue with the assembly is necessary. Ahmed Said, head of the Free Egyptians party, told Ahram Online that his party was in direct contact with the Constituent Assembly and was planning to hold a set of public dialogues throughout Egypt on the constitution-drafting assembly's proposed articles. "We will have weekly debates, inviting a number of political actors and public figures to discuss each proposed article at a time and listen to the opinion of the people and hopefully build pressure this way," explained Said. Sahar El-Tawila of the IDSC stressed to Ahram Online the importance of engaging with the assembly. "I was one of the strongest critics of the way the assembly was formed. However, I think we need to engage with them and they are willing to listen. We will be holding roundtable discussions at the centre involving all civil society representatives, during which we will discuss the proposed draft articles," said El-Tawila. Moreover, Minister of Parliamentary and Legal Affairs Mohamed Mahsoub has repeatedly urged members who boycotted the Constituent Assembly to rejoin, arguing that the assembly is open for everyone to take part in drafting Egypt's new constitution. He also stressed that the contributions of those who withdrew would settle disagreements in favour of rights and freedoms. "We're cooperating with other political parties to produce a vision for the new constitution… we will not present it to the Constituent Assembly, but will communicate it to the people," said Hossam Moenes of the Popular Current, a movement that centres around former presidential candidate Hamdeen Sabahi. "The constitution is not an elitist issue as often portrayed… We will be campaigning for our vision amongst people and our focus will be to make sure economic and social rights are guaranteed in the new constitution," added Moenes. Raouf shared similar plans as those of Moenes. He explained he was taking part in a newly launched campaign titled "Campaign for Defending Democracy" which plans to tour the different governorates of Egypt raising awareness on the proposed constitution articles and provide a vision for the new constitution. The campaign's first public panel started on Tuesday in Alexandria and will be touring the country's different governorates. Posters, short films and flyers are also in the making, explained Raouf, who added that taking part in the campaign were several youths groups and individuals. Prominent rights activist Hossam Bahgat’s Egyptian Initiative for Personal Rights organisation is also coordinating and working with the campaign, according to Raouf. Other NGOs have also taken initiatives to aid activists in their constitution campaigns. The Development Support Centre and the Egyptian Centre for Economic and Social Rights recently helped publishing a book by legal expert Abdallah Khalil using different constitutions as examples of how to translate the January 25 Revolution slogans ('Bread, Freedom and Social Justice') into constitutional articles. Political parties on the other hand still seem to be unclear as to how their constitution campaigns will be implemented. According to Attia, parties are coordinating to formulate a united plan through the Third Current initiative, announced earlier in June by several political parties vowing to fight military Islamist hegemony and defend personal rights and the implementation of a civil-democratic state. However, Ahmed Said of the Free Egyptians Party denied the Third Current is playing any significant role, explaining that some parties such as the Constitution Party were not even part of the initiative and are working to create alternative coordinating fronts. Brian thank you for your analysis. I might add some of my observations. The minority parties are getting worried that the monetary benefits under new constitution will be not as enormous as these are now. There is great wage disparity between well educated and basic degree holders in Egypt. Those who work for foreign NGOs, the media, and arts will not be able to have higher salaries, when evrything settles down. The liberals, the artists, the media goons were making very good living in MUbarak era. They are worried those perks will be gone. Whole fuss is about money and rewards.